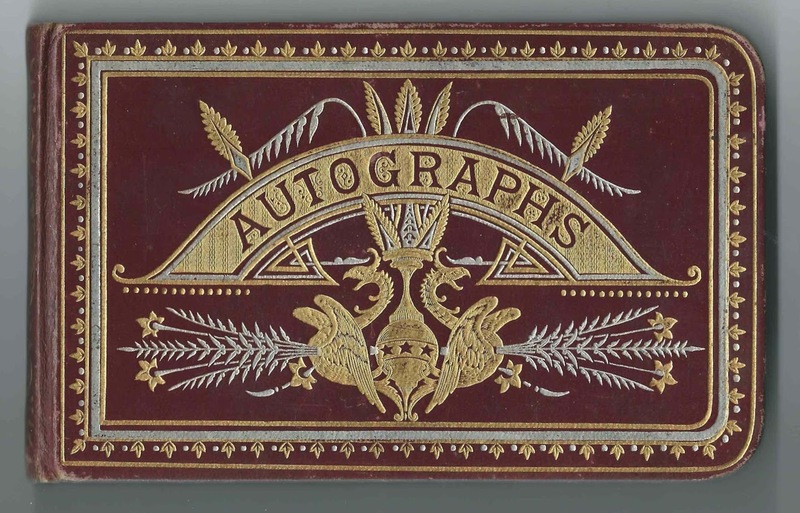 1883-1899 autograph album that belonged to a Hattie from the Hannibal, New York, and Oswego Falls, New York area. Oswego Falls is located in the city of Fulton, New York. From clues in the album, I believe Hattie was Hattie Williams, daughter of Albert and Mary (Spurr) Williams, but I welcome alternative theories. 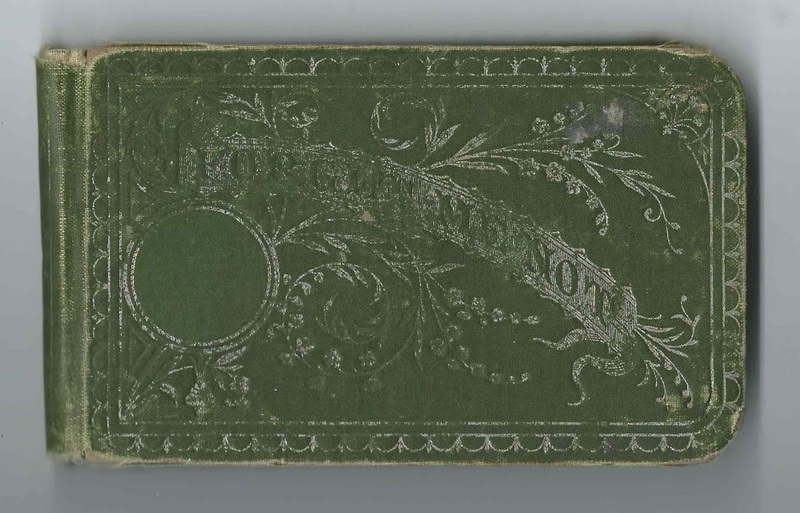 The album measures approximately 7" x 4-1/4" and contains the sentiments of 33 of Hattie's relatives and friends. An alphabetical surname list and an alphabetical list of the signers, together with any personal information they offered, appear at the end of this post. 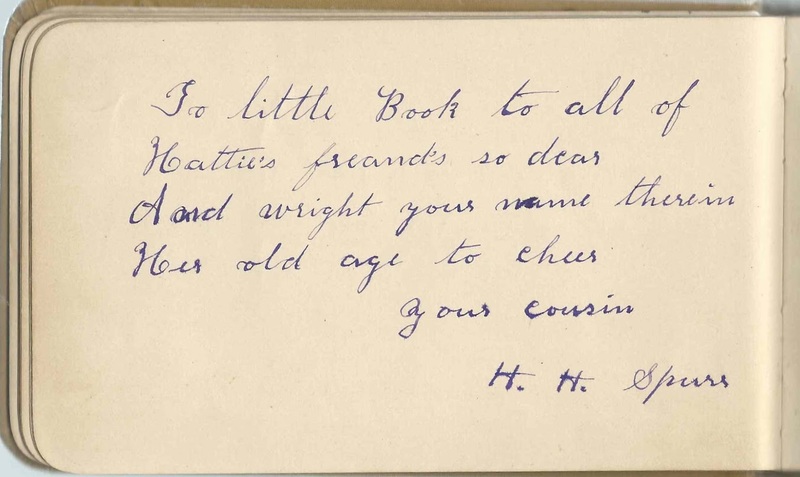 One signer, Mabel Williams, indicated that she was Hattie's sister on the page she inscribed on August 14, 1895. She may have been a sister or a sister-in-law. Two other people named Williams inscribed pages in the album, but they didn't specify a relationship with Hattie, though I think they were siblings. 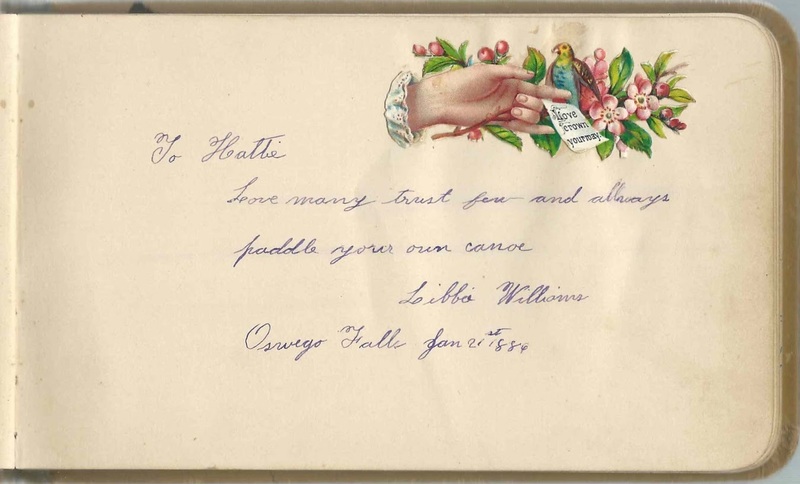 They were Lewis W. Williams, who inscribed a page at Oswego Falls, New York, on December 27, 1883, and Libbie Williams, who inscribed a page at Oswego Falls, New York, on January 21, 1886. H. H. Spurr called himself Hattie's cousin; his father Edwin Spurr was a brother to Hattie's mother Mary (Spurr) Williams. Edward H. Spurr inscribed a page at Wolcott, New York, on December 18, 1884, but did not specify a relationship with Hattie. Hattie Williams was born about 1854, the daughter of Albert and Mary (Spurr) Williams. I found the family in 1870 Census of Hannibal, New York. After that, I lost track of her because of all of the possible Hatties in and out of the area. If you have corrections and/or additions to the information above, or more information on any of the signers listed below, please leave a comment or contact me directly. Crahan J Parks  W ? R. Ingraham, signed on June 15, 1885. "If you ever see a Chap like me, a coming through the Rye, just wade up to the Rascal and kick him in the eye." Emily Martin, signed at Philadelphia, on August 9, 1884; she inscribed two consecutive pages. 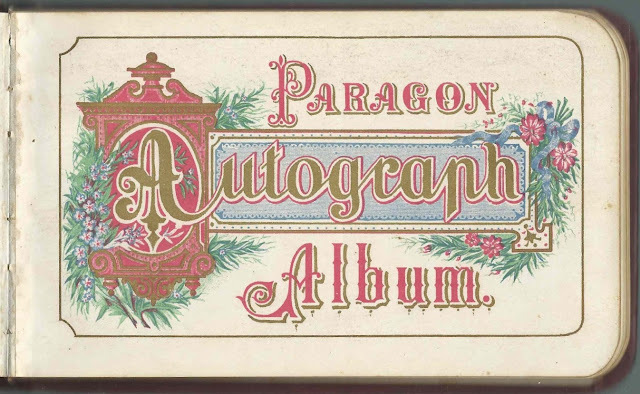 1877-1880s autograph album that belonged to Ida M. Ferguson at Atchison, Kansas, possibly a student at Atchison Institute, which one signer mentioned. 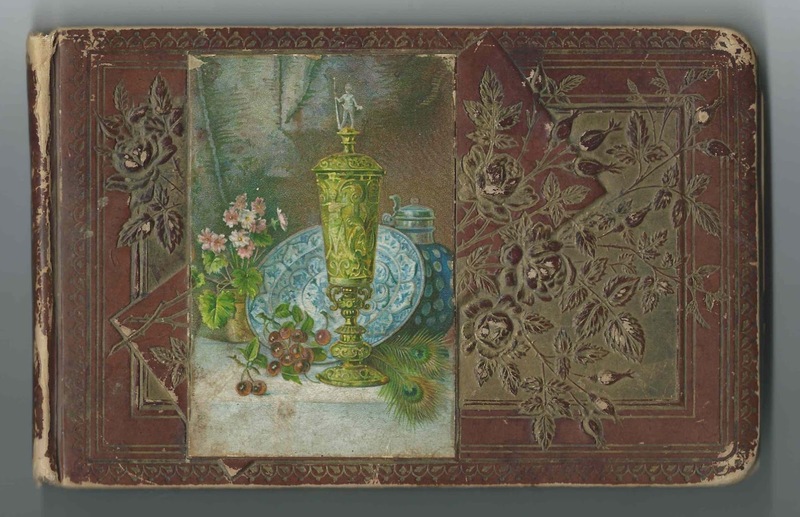 The album measures approximately 5-1/4" x 3" and contains the sentiments of 29 of Ida's relatives, friends and schoolmates. An alphabetical surname list and an alphabetical list of the signers, together with any personal information they offered, appear at the end of this post. 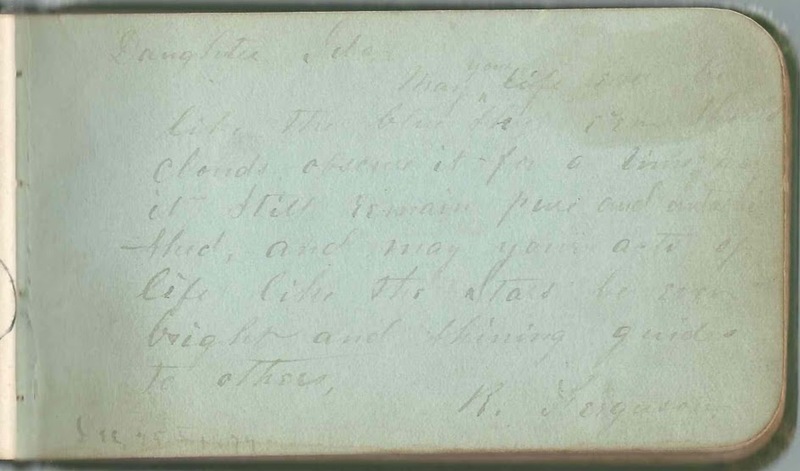 Hopefully the list of signers will provide a reader with more clues to Ida's identity. I found Ida and her sister Emma H. Ferguson, who inscribed a page in the album, boarding in the home of printer Henry Root and wife Mary in the 1880 Census of Atchison. It indicates that the girls were born in Pennsylvania, Emma about 1860 and Ida about 1863. Emma signed at "Home" on January 30, 1881. Could "Home" have been back in Pennsylvania? 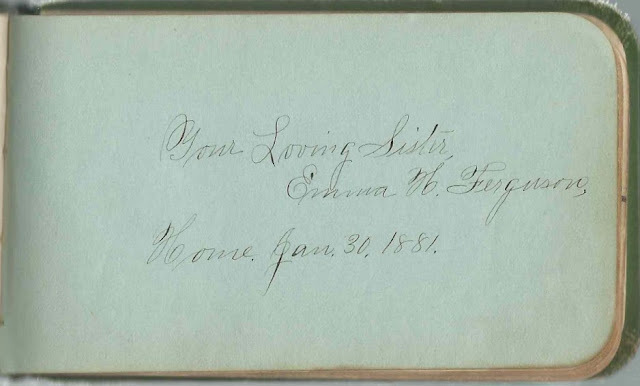 The sisters' father or mother inscribed a page on December 25, 1877 [or 1879], either R. Ferguson or B. Ferguson. If you have further information on Ida M. Ferguson and Emma H. Ferguson, please leave a comment or contact me directly. 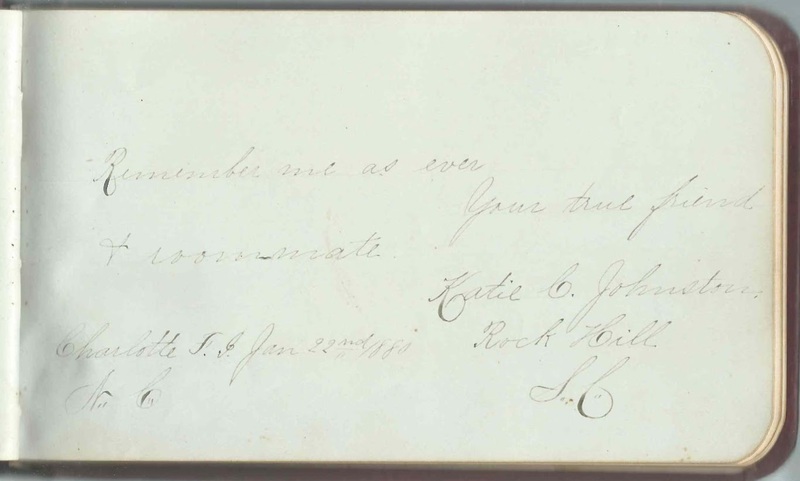 Elva Culver of Nortonville, Kansas, inscribed a page at Atchison Institute on "6-1-1880". Most signers gave Kansas as an address, with one from Ohio and one, Peter Jones, from Halifax, Nova Scotia. Mama's Pet, signed on January 7, 1891; perhaps Ida's child? 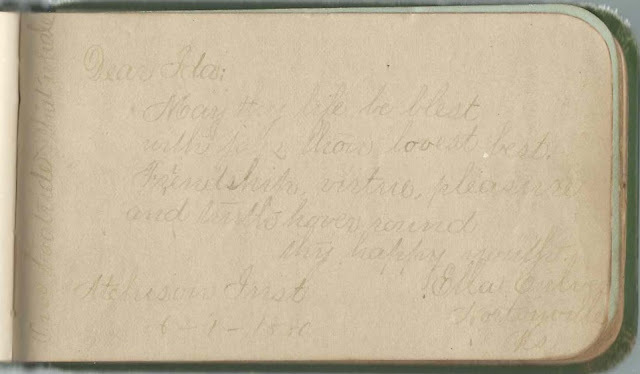 "Unknown", signed at Effingham, Kansas, on "5-8-1882"
Ella Culver of Nortonville, Kansas, signed at Atchison Institute on "6-1-1880"
R. Ferguson or B. Ferguson, signed on December 25, 1877; either Ida's mother or her father. 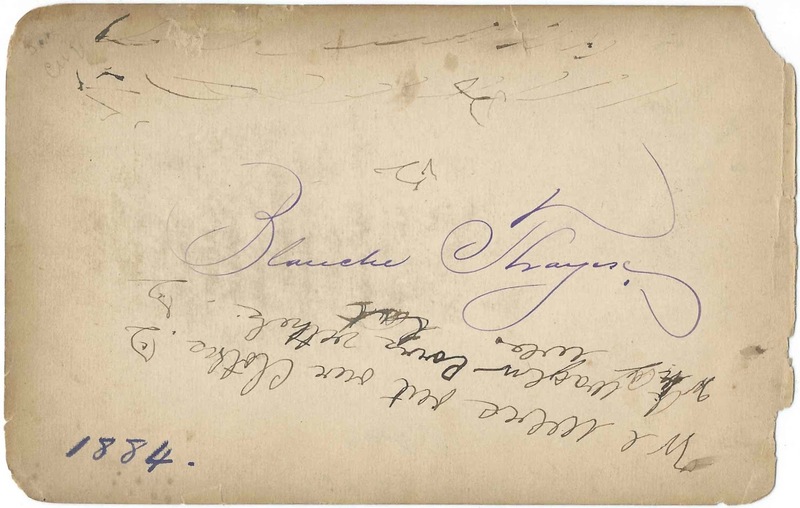 Emma H. Ferguson, signed at "Home", on January 30, 1881; not positive of middle initial. Ida's sister. 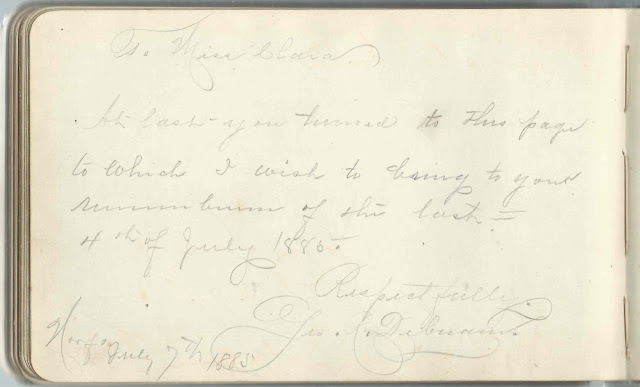 Nettie S. Markham of Atchison, Kansas, signed on "6-2-1880"
Nora D. Shea, signed at Atchison, Kansas on June 5, 1880; shared the page with Mary B? Flora Sprang of Nortonville, Kansas, signed at Atchison, Kansas, in 1880. Very faint. 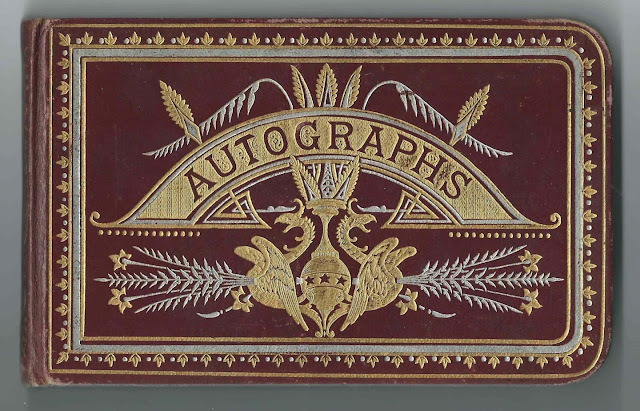 1880s/1890s autograph album that belonged to a Julia of the East Meredith, New York, area. From clues in the album, I believe she was Julia Gilchrist, daughter of Finley and Elizabeth Sabrina (Rathbun) Gilchrist of East Meridith. The album measures approximately 5-1/4" x 3" and contains the sentiments of 58 of Julia's relatives, friends and schoolmates. An alphabetical surname list and an alphabetical list of the signers, together with any personal information they offered, appear at the end of this post. Julia Gilchrist was born about 1868 in New York, the daughter of Finley and Elizabeth Sabrina (Rathbun) Gilchrist. 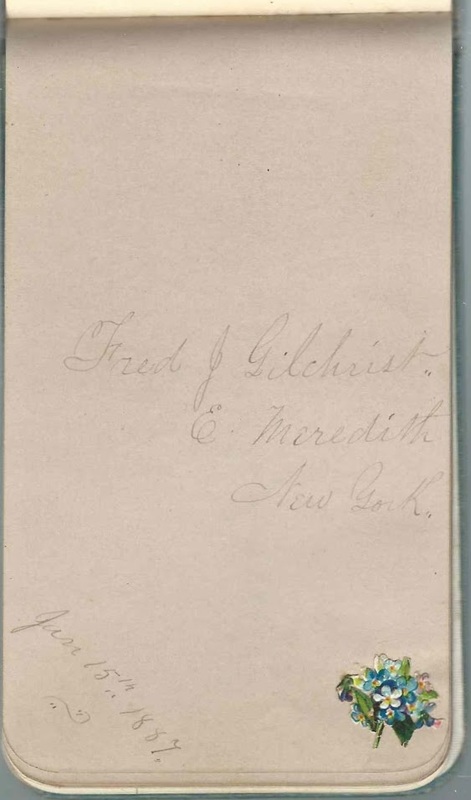 Mrs. Finley Gilchrist of East Meredith, New York, presumably Julia's mother, inscribed a page in the album on January 15, 1887. Julia's sister Lula Gilchrist and brother Fred J. Gilchrist signed on the same day as their mother, January 15, 1887. Other relatives who signed were cousins Jessie McNee; Lizzie Aitken; and Margaret Gilchrist. About 1894, Julia married John Edward Strangeway, son of William T. and Margaret T. (Dunn) Strangeway. Julia and John had three children, daughters Mary and Lulu and sons William and Edward. John died in 1925, and Julia after him, though I don't know the year. They're buried at Woodland Cemetery at Delhi, New York. If you have corrections and/or additions to the information above, or information about any of the signers listed below, please leave a comment or contact me directly. 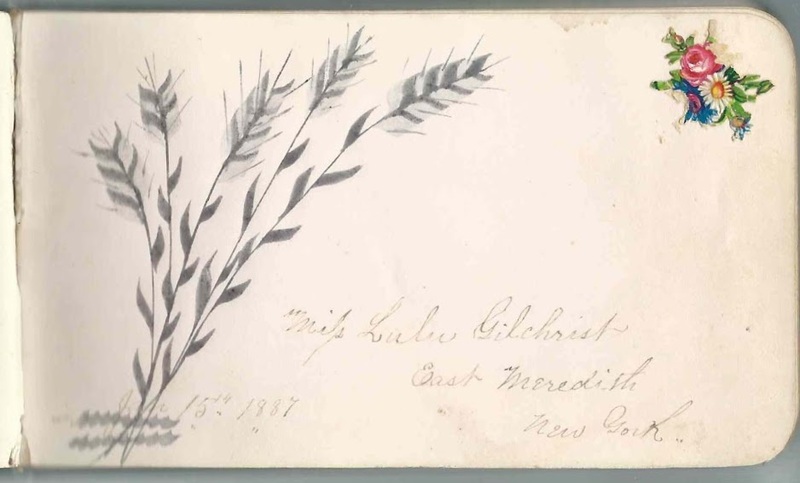 Mrs. Finley Gilchrist of East Meredith, New York, signed on January 15, 1887. Julia's mother, Elizabeth Sabrina (Rathbun) Gilchrist. Margaret Gilchrist, signed at Delhi, New York, on April 21, 1891; Julia's cousin. Margaret Gilchrist's father Andrew Symington Gilchrist was a brother to Julia's father Finley Gilchrist. Fred L. Hager of East Meredith, New York, signed on January 25, 1889. "Hurrah For Harrison & Norton"
Lois E. Hanford of East Meredith, New York, signed on December 6, 1886. 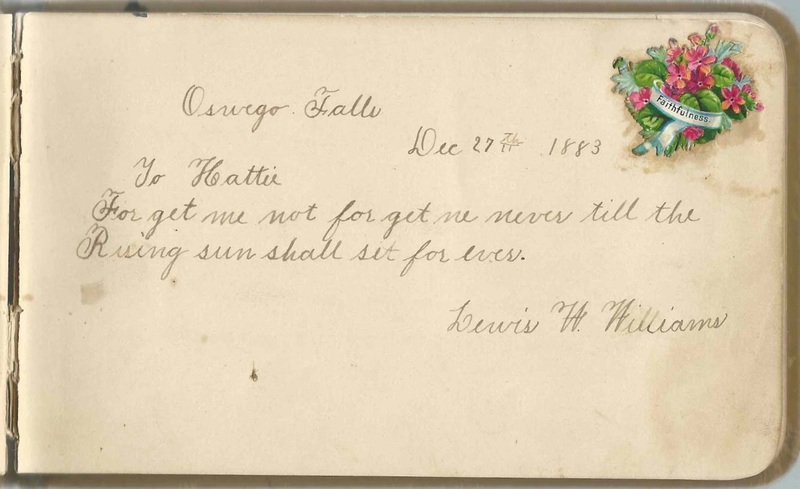 "Remember Dec. 18 1885"
Nancy A. Haslett of East Meredith, New York, signed on November 2, 1888. "Hurrah for Fisk C. Brooks and protection for the American home"
M. B. Kerr of Athens, New York, signed on February 7, 1890. Not sure of first initial. Could even a name or abbreviation of a name, rather than an initial. Possibly Robt. B. Kerr, father of signer Horace S. Kerr. H. S. Kerr, signed on February 12, 1890; presumably Horace S. Kerr. Mrs. R. B. Kerr, signed at Oneonta, New York, on March 1, 1890. Presumably Sarah Kerr, wife of Robert B. Kerr. Mrs. M. Peck of Meredith, New York, signed on November 26, 1890. Middle initial possibly I or S or J. If J., she should be Mary J. (Hanford) Peck, wife of Ambrose B. Peck. G. D. Rathbun of Utica, New York, signed on October 12, 1890; presumably George Delano Rathbun, brother of Julia's mother Elizabeth Sabrina (Rathbun) Gilchrist. Mrs. J. H. Thompson of East Meredith, New York, signed in February 188?, possible 1889 or 1885 or ? Mrs. Libbie Warren of Meredith Hollow, New York, in Delaware County. Presumably Elizabeth (Gilchrist) Warren, whose husband George signed the right facing page. George A. Warren of Meredith Hollow, New York, in Delaware County. His wife Libbie Warren, presumably Elizabeth (Gilchrist) Warren, signed the left facing page. 1883-1885 autograph album of Clara May Holt of Portsmouth, Virginia, with some of the sentiments acquired while she was a student, presumably at Norfolk College at nearby Norfolk, Virginia. 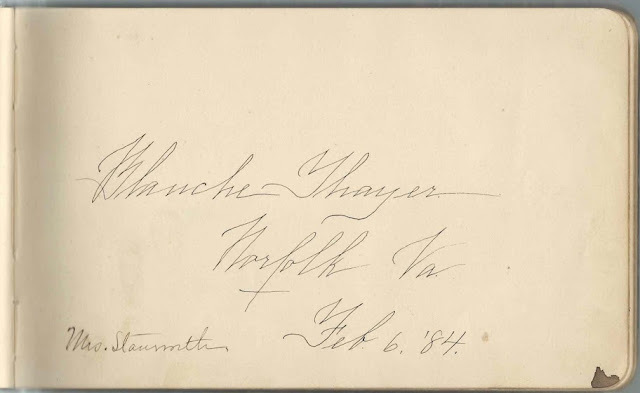 Interestingly, an earlier post featured the autograph album of another Norfolk College student, Blanche Thayer, who signed a page in Clara's album. 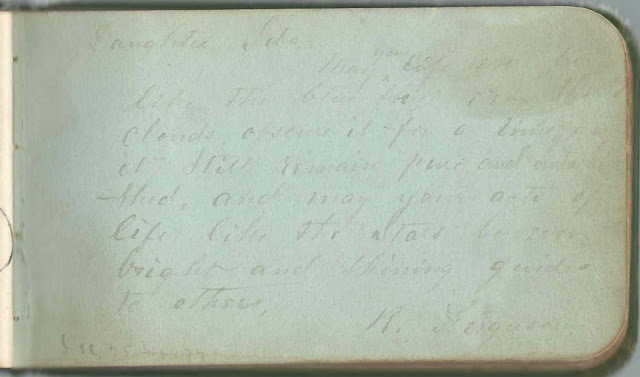 Clara's album measures approximately 7-3/4" x 4-3/4" and contains the sentiments of 58 of her relatives, friends and schoolmates, as well as notes added by Clara about signers' subsequent marriages and deaths. An alphabetical surname list and an alphabetical list of the signers, together with any personal information they offered, appear at the end of this post. Many of the people signed pages in Blanche's album as well. As you can see from the page above, Clara added notes to many of the pages, to note the marriages or deaths of her well wishers. In Blanche's case, Clara noted that Blanche married a Mr. Stanworth; he was Paul Clifton Stanworth. Clara May Holt was born July 15, 1870 at Portsmouth, Virginia, the daughter of Xenophon and Susie F. (Cherry) Holt. 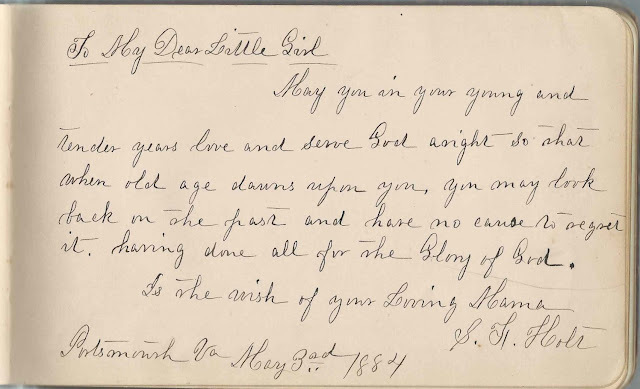 Susie inscribed a page in the album at Portsmouth, Virginia, on May 3, 1884, "To My Dear Little Girl". 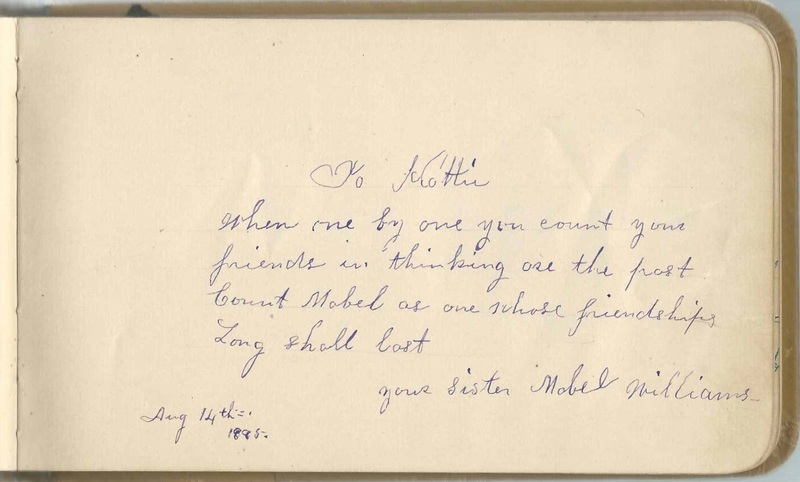 Clara's younger brother Xennie, whose name was Xenophon Drew Holt, inscribed a page on June 5, 1884. On June 18, 1890 at Norfolk, Virginia, Clara married George Raney Debnam, son of John Buckner Debnam and Mary Archer (Raney) Debnam. 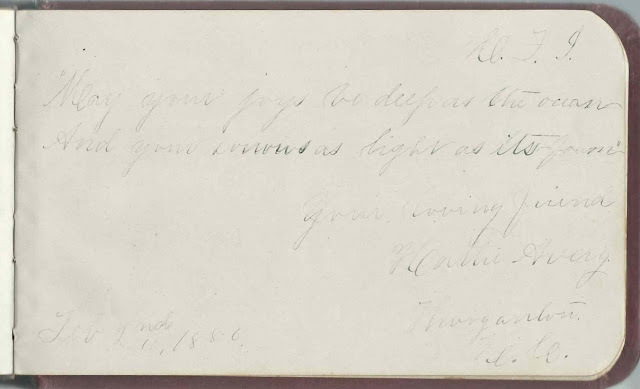 George inscribed a page in Clara's album at Norfolk, Virginia, on July 7, 1885. He implied that they had spent the previous 4th of July together, or at least had run into each other there. George's sister Bettie Debnam also inscribed a page, and Clara noted that she had subsequently married Randolph Humphreys. Clara died in 1911, and George in 1941. They're buried at Oak Grove Cemetery at Portsmouth, Virginia. If you have corrections and/or additions to the information above, or information on any of the signers listed below, please leave a comment or contact me directly. Brinkley Debnam  Howell S W ? Maud; later note: "Mrs. Orren L. Williams"
Ida V. Barcroft, signed at Norfolk College, on April 30, 1884. Later note: "Mrs. Williams. Married April 30, 1890". She married Edwin S. Williams. Delia Byrd; Clara's schoolmate. Later note: "Mrs. Dr. Waller; Mrs. Ruffin"
M. C., signed on May 7, 1884. 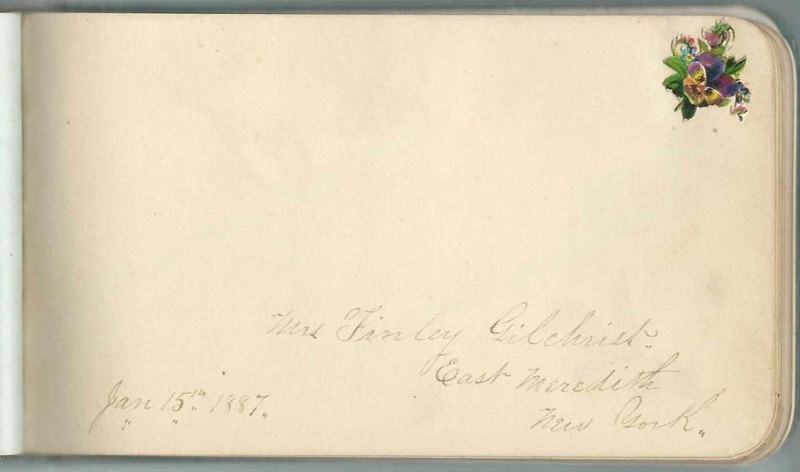 Later note: Mrs. Ridgely"
W. H. Cooke, signed at Meltons or Miltons, Virginia, on July 9, 1884. Later note: "Married, Miss Coffee". From that clue, it can be determined that the signer was Welford H. Cooke, who married Lennor Elwood Coffee on July 29, 1891 at Bedford, Virginia. Rosa Cutchin, signed on February 5, 1884. Later note: "Married Mr. Johnson"
Calling card pasted on the page of Mrs. T. Wiley Davis of 2700 Broad Street, Richmond, Virginia; dated August 31 [no year written]. Alternatively, could be Mrs. F. Wiley Davis. Katie Day, signed at Norfolk College, Virginia, on February 6, 1884. Later note: "Died March 4, 1885"
Bettie. Later note: Married Oct. 9, 1889. Mrs. Randolph Humphreys. Died, Feb. 15, 1898". I found where a Randolph Humphreys married a Bessie Debnam on that date. "Bessie" was apparently an indexing error for Bettie Debnam. Bettie was a sister to album owner Clara Holt's future husband George Raney Debnam. George R. Debnam, signed at Norfolk, Virginia, on July 7, 1885. He was George Raney Debnam, Clara's future husband. He told her to remember the 4th of July 1885, which apparently they spent at least part of together. Evelyn Eberson, signed at Norfolk, Virginia, on January 31, 1884; Clara's schoolmate. Later note: "Married Mr. [L?] Lowenberg. Interestingly, the only marriage I found for Evelyn was to Henry Clay Hofheimer in 1891; perhaps she had been married before. Lelia S. Edmunds, signed on May 2, 1884 at "City", presumably Portsmouth, Virginia, or Norfolk, Virginia. S. Tommie Hall, signed at Norfolk, Virginia, on January 16, 1884. S. Thompson Hall. Later note: "Mrs. John M. Lander"
M. J. Look or Looke or ? R. H. F. M., signed at Portsmouth, Virginia, on February 5, 1884. Later note: "Dead"
E. A. MacWilkie, signed on February 6, 1884. Fergus F. Macwilkie, signed on February 5, 1884 at "City", presumably Portsmouth, Virginia, or Norfolk, Virginia. Later note: "Married Miss Van Leer" She may have been Nellie VanLeer. Nettie Norsworthy, signed on February 5, 1884; Clara's schoolmate. 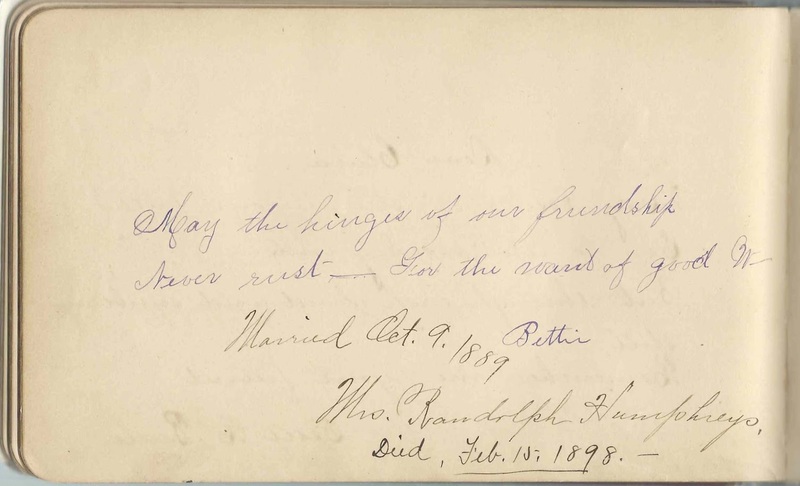 Later note: Mrs. Southgate, Married Oct. 6, 1891"
H. E. Riell, signed at Portsmouth, Virginia, on March 25, 1885. Presumably Harry E. Riell. Virginia Scholefield, signed at Norfolk College on January 20, 1884. Later note: "Mrs. Arnott"
Blanche Thayer of Norfolk, Virginia, signed on February 6, 1884. Later note: "Mrs. Stanworth"
Clifford D. Virnelson, signed at "City", presumably Portsmouth, Virginia, or Norfolk, Virginia, on March 9, 1885. Later note: "Married"
Bettie Wise of Norfolk, Virginia, signed on February 6, 1884. She wrote her name backwards. F. K. Wonycott. Later note: "Married Miss Lillian Davis". From this clue, it can be determined that he was Frank K. Wonycott who married Lillian on November 10, 1891 at Portsmouth, Virginia. Sue Yeatman of Norfolk, Virginia, signed on January 5, 1884. Later note: "Married"
1879-1884 autograph album that belonged to Annie Laura McMurray of Wadesboro, North Carolina, with many of the sentiments acquired while Annie was a student at the Charlotte Female Institute at Charlotte, North Carolina, still in existence as Queens University of Charlotte. 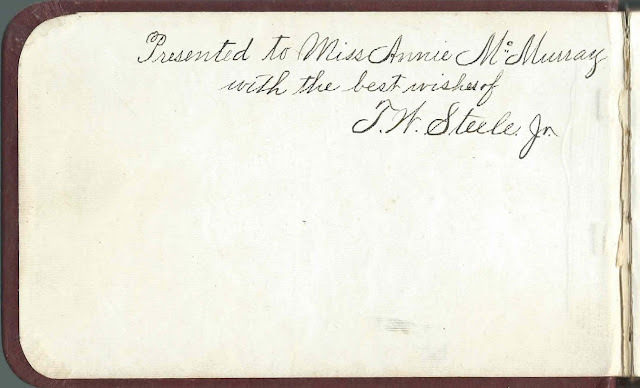 T. W. Steele, Jr., gave the album to Annie, as noted o the inside front cover. 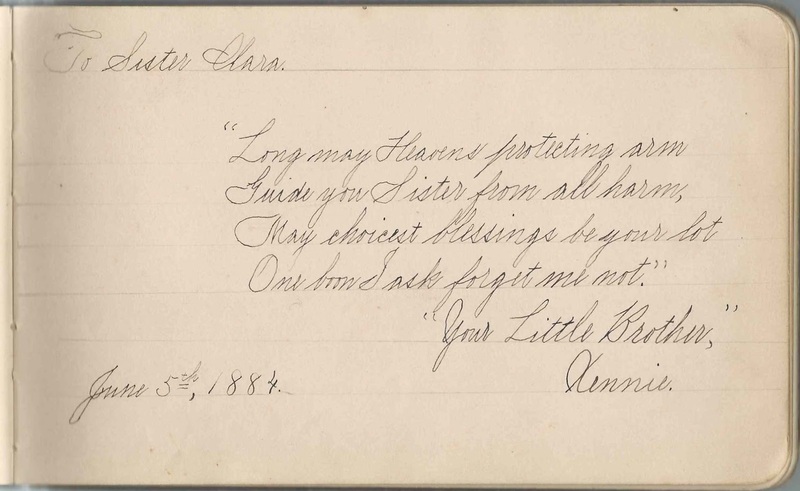 The album measures approximately 7" x 4-1/4" and contains the sentiments of 36 of Annie's friends and schoolmates. An alphabetical surname list and an alphabetical list of the signers, together with any personal information they offered, appear at the end of this post. Annie Laura McMurray was born May 24, 1863 in Union County, North Carolina, the daughter of Joseph Walkup McMurray and his first wife, Sallie Howard, who died in 1871. I believe that Annie had two full siblings, a sister and a brother, and two half-sisters from her father's second marriage to Julia Ann Little. 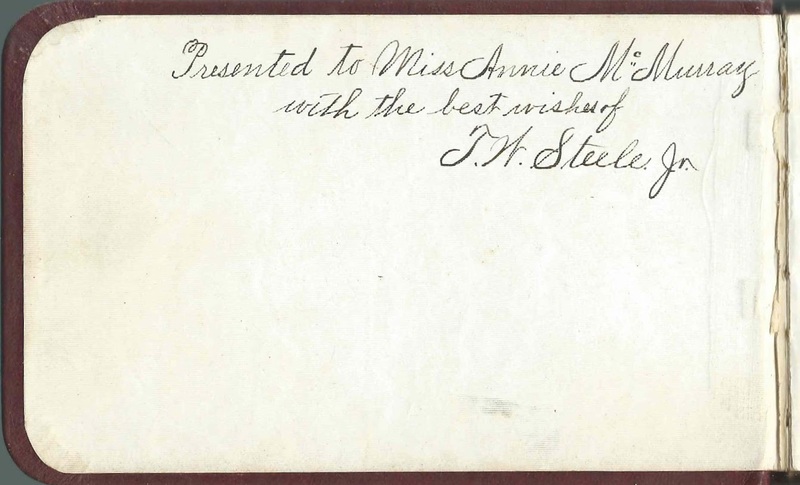 As noted above, many of the signers were Annie's fellow students at the Charlotte Female Institute. Some of them mentioned the school's initials, as did Katie C. Johnston of Rock Hill, South Carolina, who inscribed her page on January 22, 1880. And Hattie Avery of Morganton, North Carolina, who inscribed her page on February 2, 1880. See the list of signers below for the names of more students. On May 20, 1885, Annie married grocer James Osgood Andrew Craig, son of William Evans Craig and Margaret (Parke) Craig. I believe Annie and James had two children, a daughter and a son. James died in 1924 and Annie in 1926; they're buried at the Eastview Cemetery at Wadesboro, North Carolina. Tonsy or Tansy or Torrey or ? Annie McMurray, album owner; the album was given to her by T. W. Steele, Jr.
1884-1904 autograph album of Blanche Thayer of Norfolk, Virginia, with many sentiments collected while she was a student at Norfolk College. Its building is now a branch of Tidewater Community College. The album has a bit of scribbling on some pages, including the ownership page below. 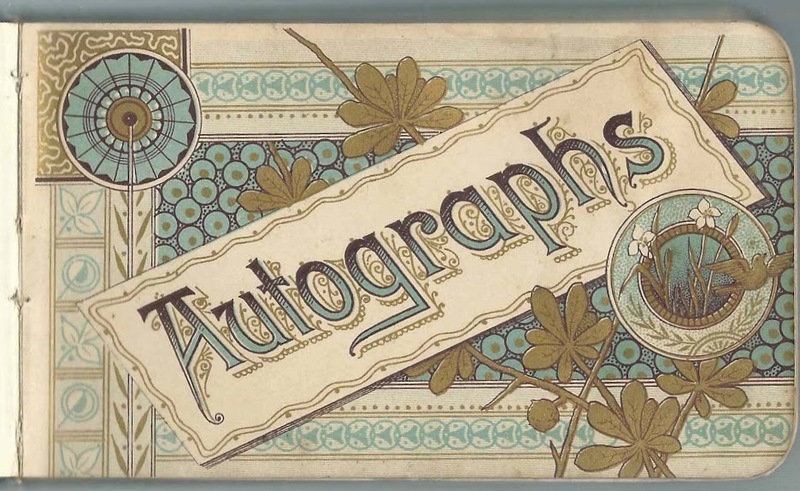 Another post features the autograph album of Clara May Holt of Portsmouth, Virginia, who was also a student at Norfolk College apparently, as several of the signers indicated that address; many of the signers inscribed pages in both albums. Blanche Thayer signed a page in Clara's album; Clara, as she did on many of the pages, added a later note, which indicated that Blanche had married a Mr. Stanworth. He was Paul Clifton Stanworth. Blanche's album measures about 8" x 5" and has many loose pages. It contains the sentiments of over 100 of her relatives, friends, schoolmates and teacher. An alphabetical surname list and an alphabetical list of the signers, together with any personal information they offered, appear at the end of this post. Blanche Thayer was born at Norfolk, Virginia, the daughter of James W. Thayer and Virginia (Milener/Millner/Milliner] Thayer. 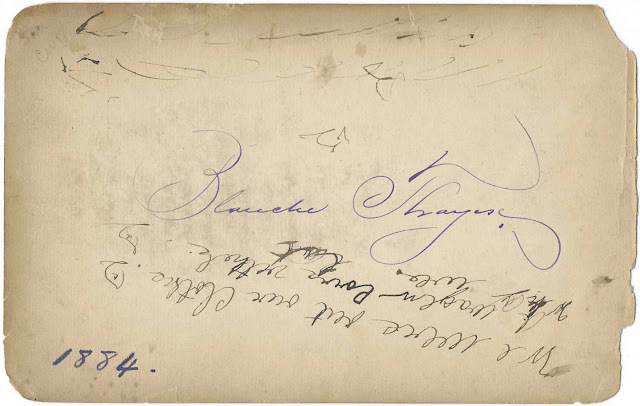 In 1888, Blanche wrote her name in the center of a group page, which also featured the signature of her sister Mabel Thayer. 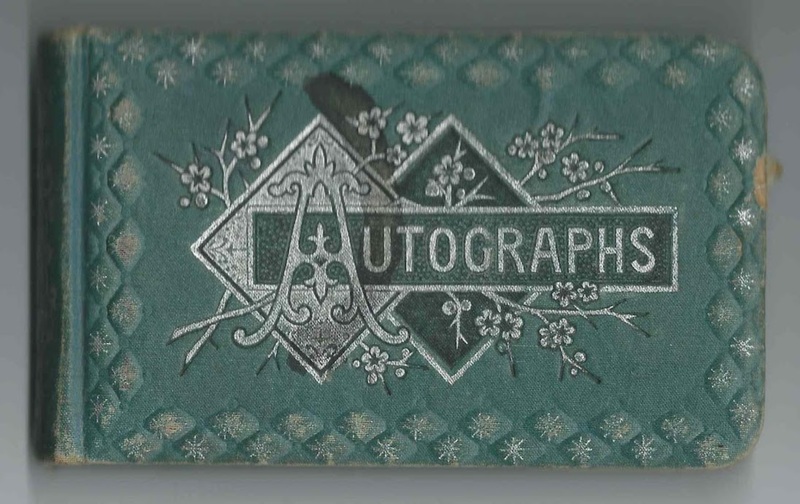 Another name that jumps out on the page above is P. C. Stanworth, who also signed an individual page. He was Paul Clifton Stanworth, whom Blanche would marry at Norfolk, Virginia, on September 18, 1893. He was the son of Thomas and Mary Ann (Connor, I think) Stanworth. 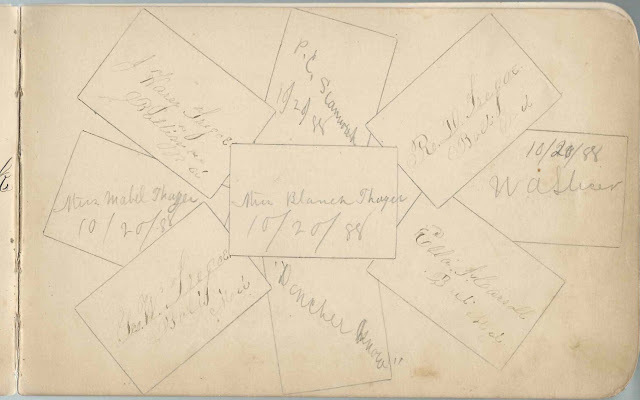 The W. J. Stanworth who inscribed another page was likely brother William J. Stanworth, who indicated that he and Blanche had been neighbors - so now we know how Blanche Thayer and Paul Clifton Stanworth met! As mentioned above, many of the signers were Blanche's fellow students at Norfolk College at Norfolk, Virginia. 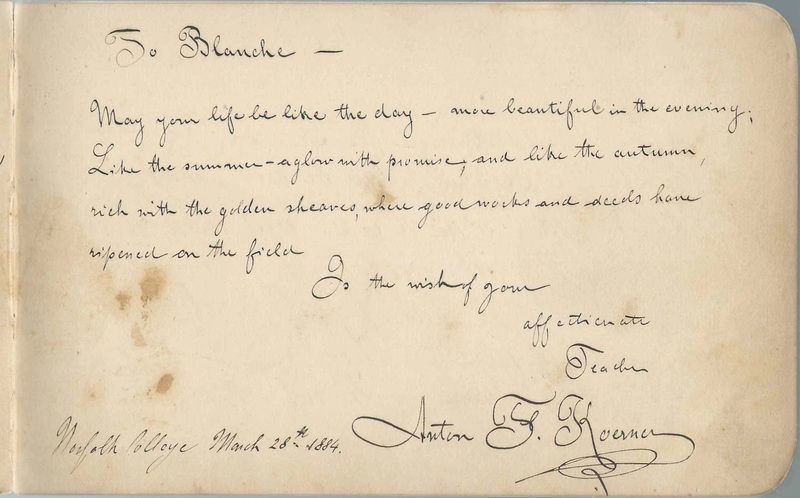 Blanche took at least one course in music, as confirmed by the page signed by her music professor Anton F. Koerner on March 28, 1884. Also writing her name in the album in 1902 and 1904 was Alma Stanworth, daughter of Blanche and Paul Clifton Stanworth. 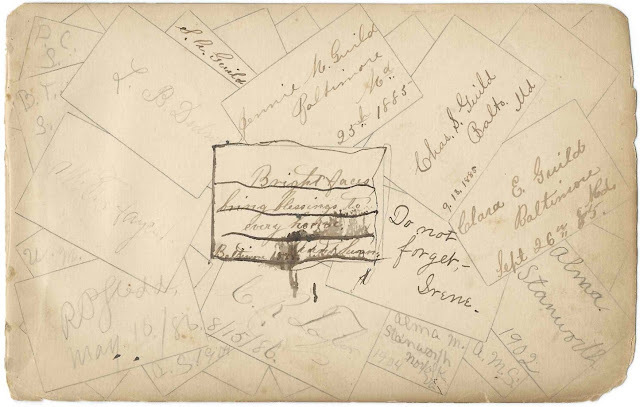 She wrote her name three times in the lower right corner of another group page that featured several members of the Guild family of Baltimore, Maryland and others. The inside front cover has a faint name that looks like Ann Brinkley. Blanche's daughter Alma Stanworth married Edward Stanley Brinkley, and they had a daughter Ann. Blanche died in 1929 and Paul Clifton in 1958; they're buried at Elmwood Cemetery at Norfolk, Virginia. If you have corrections and/or additions to the information above, or information on any of the signers listed below, please leave a comment or contact me directly. Cousin Gene, signed on October 4, 1885. The Friend of '87; shared the page with "Jumbo"
"Jumbo", signed in August 1884; shared the page with "The Friend of '87"
"Cousin Carrie, signed at Norfolk on January 21 [year obscured]. She painted a sprig of wild roses. Cousin Harry, signed at Baltimore, Maryland, on September 5, 1885. Minnie, signed at Norfolk on March 5, 1884. Painting of lilies of the valley and a butterfly. 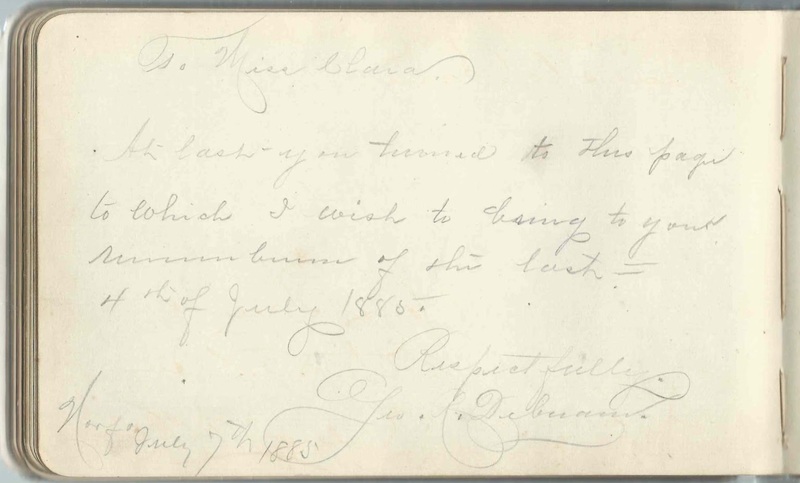 Signed in very youthful or very elderly handwriting on July 5, 1886. Can't decipher the name. 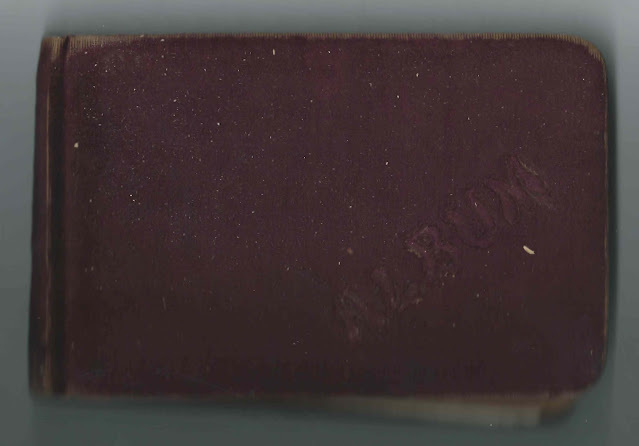 Possibly a word that starts with A, like Ann or Aunt, and a second word that starts with B.
J. McKendree K. Bayly, signed at Baltimore, Maryland, on June 16, 1890. He was Jeremiah McKendree K. Bayly, born in 1862, according to his passport application, which he completed later that month. Cousin Hattie, signed on January 1, 1884. 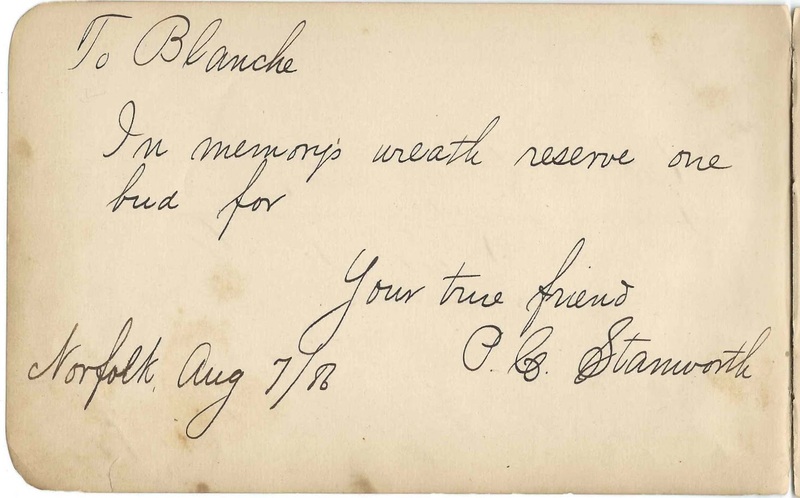 She called Blanche "Blanchette". Perhaps Hattie A. Blogg, daughter of Charlotte (Thayer) Blogg, who was a sister to Blanche's father James W. Thayer. Aunt Charlotte, signed at Norfolk, Virginia, in 1884; perhaps Charlotte (Thayer) Blogg, sister of Blanche's father James W. Thayer. Wes, signed in January 1884; perhaps Wesley C. Blogg, son of Charlotte (Thayer) Blogg, who was a sister to Blanche's father James W. Thayer. 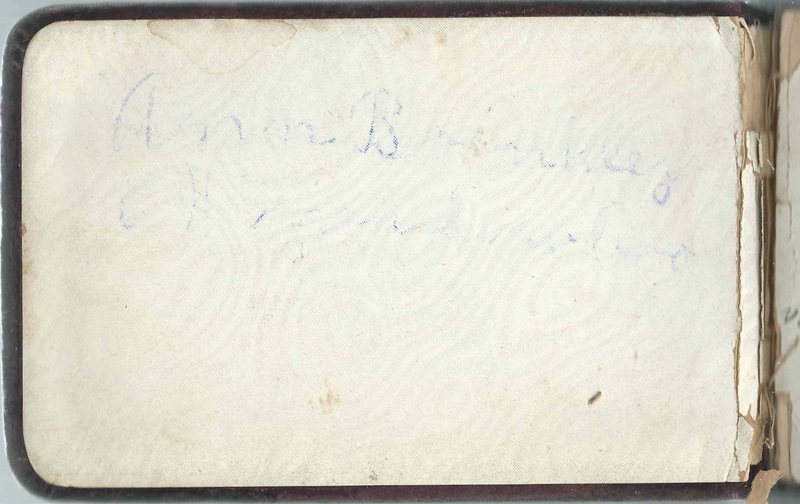 Very faint name on inside front cover; possibly Ann Brinkley. Blanche's daughter Alma Stanworth married Edward Stanley Brinkley and had a daughter Ann Brinkley, born about 1920. The name could also be Alma, but looks more like Ann. Emma Carman, signed on March 6, 1884 at Norfolk, Virginia; Blanche's schoolmate, presumably at Norfolk College. Jesse Cunningham, signed on March 1, 1889. "Don't forget your Hampton friend." 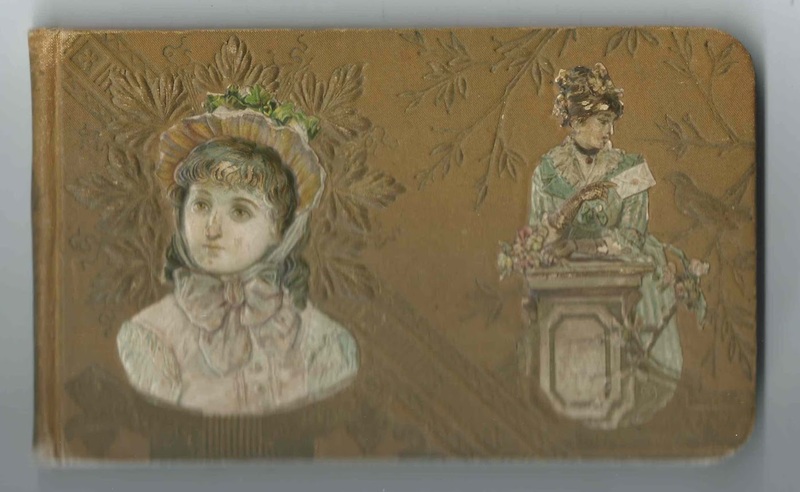 Janie Foster of Pictou, Nova Scotia, signed at Norfolk, Virginia, on February 12, 1885, perhaps at Norfolk College. Not sure of given name. James Gilmore, Jr., University of Virginia, Albermarle County. Middle initial might be A. or H.
? A. Jackson, signed at Abingdon, Virginia, in September 1888 . 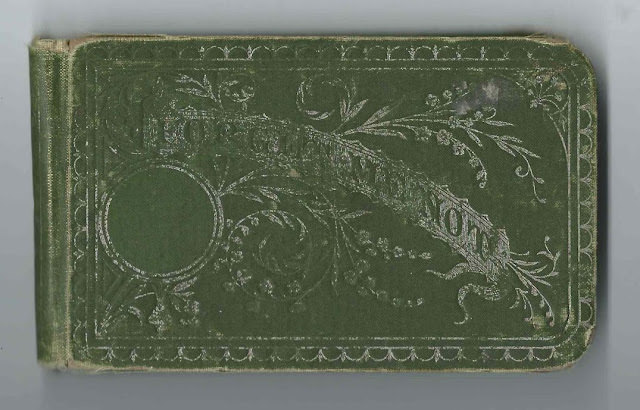 First initial obscured by later scribbling - could be G.
Mrs. S. A. Jackson, signed on September 9, 1888. Shared the page with S. H. B.
Anton F. Koerner, signed at Norfolk College on March 28, 1884. He was Blanche's music professor. Annie Howard Myers of Washington, North Carolina, signed at Norfolk College on January 18, 1886. She was a landscape and still life painter; future wife of John William Charles. W. J. Stanworth, signed on January 8, 1885; "Your old friend and neighbor". Presumably William J. Stanworth, brother of Paul Clifton Stanworth, Blanche's future husband. 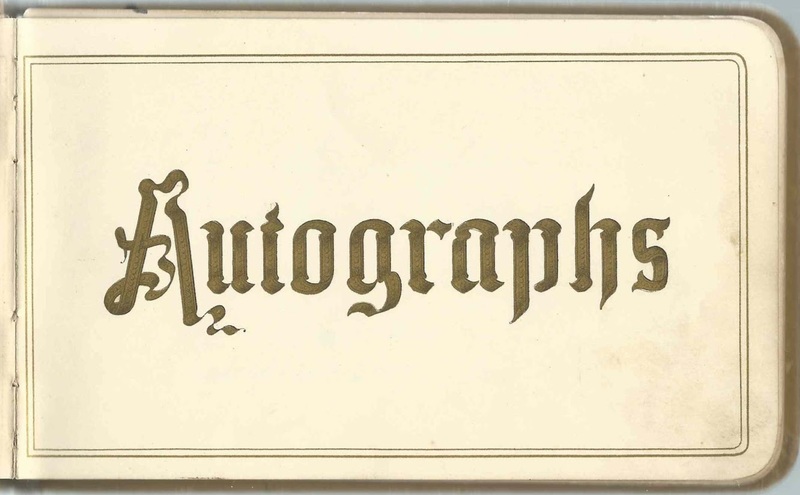 P. C. Stanworth, signed at Norfolk, Virginia, on August 7, 1886. He was Paul Clifford Stanworth, Blanche's future husband. Blanche Thayer of Norfolk, Virginia; album owner. She started the album in 1884. M. A. Y. Whitney, signed at Norfolk College, on March 6, 1884. First two initials are definitely M. A.. Third initial might be G or Z or ?